Pantone says the colour orange has been growing in popularity in recent years and Tangerine Tango is the perfect attention-getter of everything from fashion to cosmetics, home furnishings and even consumer electronics. 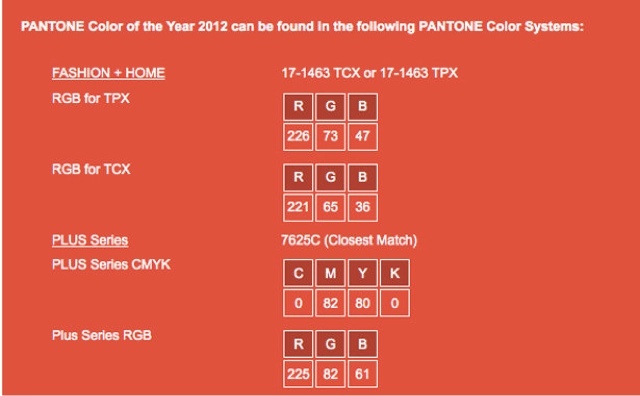 In its Fashion Colour Report 2012, Pantone says brands like Tommy Hilfiger, Nanette Lepore and Adrienne Vittadini will be incorporating Tangerine Tango in their fashion ranges. Pantone has also teamed up with beauty fashion retailer, Sephora "to create an extraordinary collection that will change how consumers wear, feel and think about colour."